The previous posts in this series, examined the importance of proficiency in use of the firefighters� primary weapon in offensive firefighting operations, and outlined several drills that can be used to develop proficiency in basic nozzle operation and hose handling. This post extends this examination of how to develop proficiency in nozzle operation and hose handling, presenting method or developing skill in working under conditions with poor visibility and application of indirect attack as an offensive firefighting tactic. I will use my nozzle effectively and efficiently to put water where it is needed. I will learn its weaknesses, its strengths, its parts, and its care. I will guard it against damage, keep it clean and ready. This I swear [adapted from the Rifleman�s Creed, United States Marine Corps]. Drills to this point have been under conditions of good visibility where firefighters can observe nozzle pattern and fire stream effects. However, on the fireground it is critical that these skills can be used effectively under conditions of low or no visibility. Sometimes it is necessary to go backward in order to move forward. One way to begin the process of developing the ability to work effectively with limited visibility is to go back to Nozzle Technique and Hose Handling Drills 1 & 2 and repeat these exercises with the firefighter�s breathing apparatus facepieces covered (unlike working in the dark, this makes it much easier for the instructors to observe and provide feedback). While this seems like an extremely slow and incremental process, it is likely to build a higher level of skill and require less time to develop proficiency than simply fumbling about in the dark! In Nozzle Technique and Hose Handling: Part 3, door entry was illustrated at an exterior door. However, this method should be used anytime that firefighters encounter a closed door that may have hot gases or fire behind it. This becomes even more important when operating in a smoke (fuel) filled environment. Smoke is fuel! The upper (hot gas) layer may contain a substantial mass of fuel that is ready to ignite. 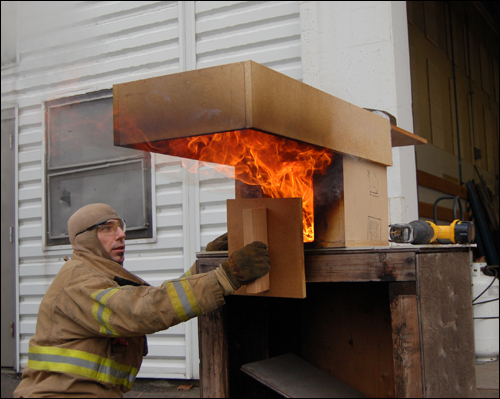 Flames exiting from a compartment door can ignite this fuel, resulting in rapid fire progression through the upper layer and into adjacent compartments. This phenomenon is demonstrated by CFBT-US Senior Instructor Trainer Matt Leech (LT Tualatin Valley Fire & Rescue) in Figures 1 through 3. While this demonstration involves use of a single compartment doll�s house and �porch roof�, the same phenomena can occur on a larger scale in any type of structure. 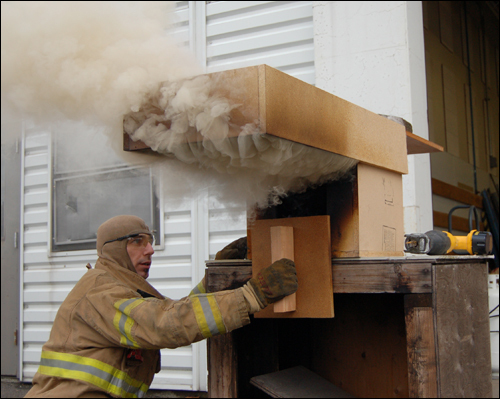 This simple demonstration illustrates the hazards presented by smoke overhead, the importance of gas cooling, and good door entry technique. While often overlooked, recognition of this hazard is not new. �Smoke contains unburned fuel and when mixed with air in the proper proportion becomes a flammable mixture� (Layman, 1955). When working under conditions of limited visibility, other sensory feedback becomes even more important to the nozzle operator. It is essential that firefighters become familiar with audible indicators of stream performance. Think about the sound of a straight stream hitting the ceiling or a wall versus the sound of a fog pattern applied into the hot gas layer (without significant contact with compartment linings). Would you be attuned to the difference in sound? This is important when you can�t see the pattern being discharged. Changes in temperature can also be an important indicator. However, it is important to remember that perceived temperature is also influenced by moisture. Excess steam production (from water hitting hot compartment linings) may make it seem like the temperature is rising, when this is due to increased moisture content in the smoke and air. If it seems like it is getting hotter, it is important to recognize if this is due to worsening fire conditions, or inappropriate water application. Drill 6-Operating Without Visual Reference: This drill integrates door entry, hose handling, and nozzle techniques (pulsing and painting) under conditions with limited visibility. The drill can be conducted with the facepiece covered, in darkness, or using cold smoke (e.g., from a smoke machine). Learners should begin by using good door entry technique on an exterior door and then move through several compartments (preferably of different sizes), encountering several doors (some of which should be closed) along the way to the seat of the �fire�. Alternately, this drill can be used to practice hose handling and nozzle technique in the context of primary search with a hoseline (or in support of crews performing search). Indirect attack is only performed from the exterior of the building. Indirect attack will push fire throughout the building. 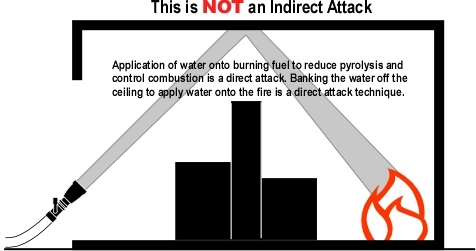 Indirect attack involves banking water off the ceiling to reach burning fuel that is inaccessible to direct application of water (see Figure 4). Indirect attack and gas cooling is the same thing. These statements are absolutely incorrect! Figure 4. What Indirect Attack is NOT. Several years ago I had a company officer that I worked with tell me that he had learned about a �new� fire control technique called the indirect attack at strategies and tactics class. I loaned him a small blue book titled Attacking and Extinguishing Interior Fires (Layman, 1955) and observed that this was not exactly a �new� idea. The concept of the indirect attack was an outgrowth of extensive study of fuel oil fires within confined spaces conducted by the instructor staff of the US Coast Guard Firefighting School at Fort McHenry in Baltimore, Maryland during World War II (Layman, 1955). The term indirect, referred to application of water into a hot compartment, but not directly onto the burning fuel. Conversion of water to steam absorbed a tremendous amount of energy and the expansion of steam filled the compartment (and potentially adjacent compartments which may also have been involved in fire). In 1947, Lloyd Layman completed his service with the US Coast Guard and returned to duty as Fire Chief with the Parkersburg West Virginia Fire Department. 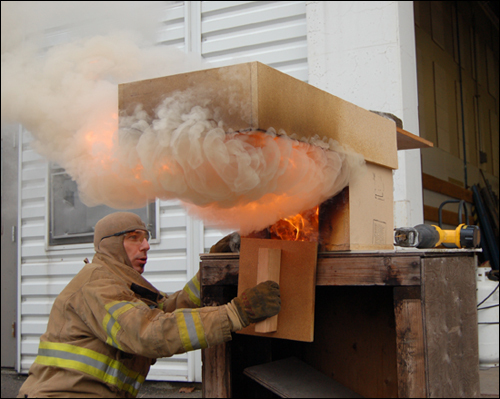 Over the next two years, Layman and the members of his department worked to implement the concept of indirect attack for structural firefighting. In 1950 Chief Layman delivered a presentation titled Little Drops of Water (Layman, 1950) which outlined the adaptation of indirect attack for structural firefighting. In 1952 he completed Attacking and Extinguishing Interior Fires (Layman, 1955), a textbook that provided a more comprehensive look at indirect attack including several case studies based on incidents in Parkersburg where this approach had been used successfully in dealing with both residential and commercial fires. As presented by Layman, the indirect attack was generally performed from the exterior of the building. However, it is important to recognize historical context. In the late 1940�s respiratory protection (when it was used) was often limited to All Service Masks, which used a filter mechanism to remove toxic products of combustion (to some extent), but could not be used in significantly oxygen deficient atmospheres. Layman�s Error: Chief Layman made a number of extremely important and astute observations, particularly with regards to the tremendous cooling capacity of water when it is not only heated to its boiling point, but also converted to steam. However, one of the major assumptions related to indirect attack was in error. Layman states: �The injection of water into a highly heated atmosphere results in rapid generation of steam�[increasing] the atmospheric pressure within the space (p. 36-37). This points to the Chief�s assumption that steam produced as water was evaporated in the hot gas layer added to the total volume of gas and vapor within the space (i.e., the volume of steam was added to the volume of smoke and hot gases in the compartment). As discussed in Estimating Required Fire Flow: The Iowa Formula [LINK]; this is incorrect, water vaporized as it passes through the hot gas layer actually reduces total volume (due to cooling of the hot gases). On the other hand, water that is vaporized in contact with hot surfaces (that did not significantly cool the gases as it passed through the hot gas layer) adds to total volume as expanding steam is added to the volume of hot gases within the compartment. The difference between indirect attack and gas cooling will be explored in detail in my next post on Fire Stream Effectiveness and Efficiency. Drill 7-Indirect Attack from the Door: When faced with a fully developed fire in an enclosed area or a severely ventilation controlled fire (decay phase) that presents potential for a ventilation induced flashover or backdraft. Indirect attack may be an effective option for fire control. However, this tactic is not limited to exterior operations. Indirect attack can be initiated as part of the door entry procedure (exterior or interior doorway). If dynamic risk assessment indicates that entry is not viable due to fire conditions, the nozzle operator can use long pulses from the doorway (while the other member of the hose team controls the door) to apply water to hot surfaces, producing steam to gain control of conditions within the compartment prior to entry. This fire control method should be integrated with effective tactical ventilation (think planned, systematic, and coordinated). This approach can be extremely useful when the door to the fire compartment can be controlled and the hose team is presented with multiple priorities (persons reported and the need to control the fire to maintain the safety of interior operations). Figure 6 illustrates an example of how an indirect attack may be used when operating from the interior. In this scenario, the first arriving engine observes a fully developed fire in the bedroom on the A/D corner of a single family dwelling and receives information that an occupant is in the bedroom on the C/D corner. Rapidly developing fire conditions require immediate fire control. The crew makes entry from Side A, cools the hot gases overhead as they proceed to the fire compartment. 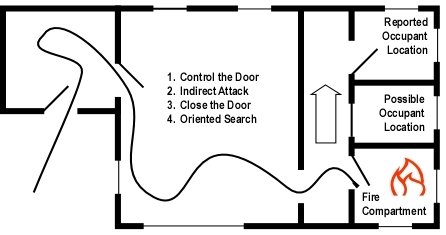 As it is necessary to control the fire before proceeding past the involved compartment, they control the door, implement an indirect attack, and then extend an oriented search to locate the occupant while the nozzle operator protects the means of egress and maintains orientation for the firefighter performing the search in the adjacent compartments. Figure 6. Application of Interior Indirect Attack. 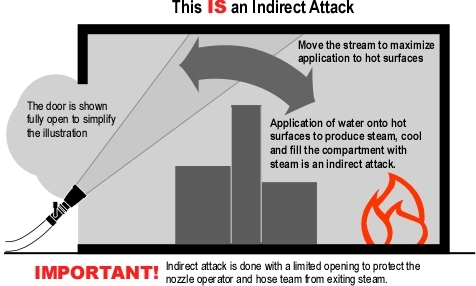 While there are other tactical approaches that could be taken in this situation, use of an indirect attack allows the hose team to address both life safety (firefighters and occupants) and fire control tactical priorities. Layman, L. (1955). Attacking and extinguishing interior fires. Boston, MA: National Fire Protection Association. Layman, L. (1950). Little drops of water. Unpublished paper, presented at the Fire Department Instructors Conference (FDIC), Memphis, TN. for the link,concerning the drill number 6,i got the 404 error:page not found. thanks,as usual,i will translate,and put a link to the french translation.